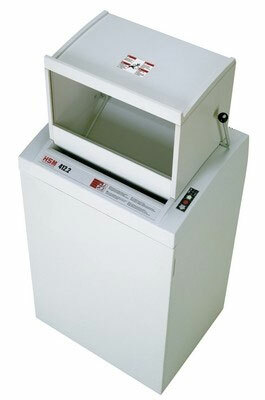 High performance AC model with additional filling hopper and integrated pre-compactor for crumpled paper, for use in IT departments and office floors. Can even destroy entire computer listings and shred floppy disks, CDs, credit and store cards as well as DAT cartridges. Infeed slot with splinter protection. Keypad control for constant operation and reverse. Photoelectric cell for automatic start/stop control. Stops automatically when the waste bag is full and when the door is open. Convenient automatic reverse in the event of paper jam. Modern electronic controller. Stand-by mode with LED indicator. With removable, reusable waste bag. Made in Germany.